The Boys and Girls Clubs of Lorain County’s Desich Family Campus had its annual holiday party at Equity Trust again this year and Equity Trust employees helped purchase the toys for 150 students... with 136 of the children attending the holiday party at our company headquarters. Equity Trust received the 2018 Northeast Ohio Smart Business Customer Service Award! Thank you so much to all of our employees and clients for making this possible. Smart Business is proud to recognize 20 organizations that have demonstrated their commitment to delivering world-class customer service — both internally and externally. Equity Trust Company silver award winners of the 2018 W³ AWARD for digital excellence for the launch video announcing our myEQUITY.com online client platform. The W3 Awards have over 5,000 entries each year from some of the largest marketing teams on the plant (Apple, Mike, Disney) and our launch video with was one of those chosen to represent digital excellence. myEQUITY offers the functionality to complete and submit new account applications for Traditional, Roth, SEP and SIMPLE IRAs, Coverdell Education Savings Accounts (CESAs) and Health Savings Accounts (HSAs). The online application utilizes e-signature to complete the new account request. Since 1998, The Medical Mutual Pillar Award for Community Service, presented by Smart Business, honors businesses of all types and sizes that make outstanding contributions to their communities. Its purpose is to encourage a charitable environment, recognize creative efforts that make a difference and demonstrate the ties between the for-profit and nonprofit worlds. The Pillar Award for Community Service currently takes place in the cities of Cleveland, Columbus and Cincinnati. Though much larger than when it was established, Equity Trust has remained a family-owned company that promotes a family-oriented culture. This was celebrated recently as Smart Business magazine recognized Equity Trust and 16 other Cleveland-area family-owned companies with the 2018 Family Business Achievement Award. It was a stormy night July 26, but the weather didn't seem to bother guests and presenters at the "What's Brewing in Westlake" business networking and fundraiser. Equity Trust hosted the event, which benefitted social service programs of the Westlake Senior and Community Services Department. The department provides assistance to hundreds of the nearly 1,300 Westlake residents -- which is nearly 5 percent of the city's population -- who live in poverty. Mayor Dennis Clough recognized some of the dignitaries and officials in attendance, including Richard Desich Jr., Equity Trust co-founder and event host, and city officials. 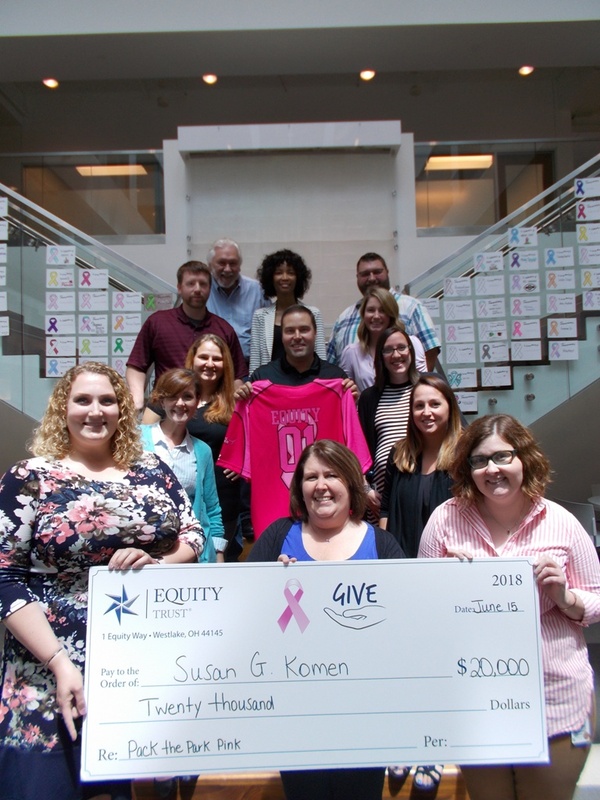 On June 15, Equity Trust presented Susan G. Komen Northeast Ohio with $20,000 to help fund breast cancer research. The presentation took place at the Lake Erie Crushers Pack the Park Pink promotional night, which also raised money for the cause. Equity Trust has facilitated a donation to Baldwin Wallace University totaling nearly $1 million and endowed the Desich Family Community Impact Scholarship. The scholarship fund will support BW students engaged in community service. It is representative of a longstanding BW tradition of support for endowed scholarships that broaden student access to a quality higher education. For a third year, Equity Trust Company was named a Silver Award Winner in the 2017 Healthy Ohio Healthy Worksite Award from The Healthy Business Council of Ohio (HBCO). The HBCO recognized 73 Ohio employers for healthy worksite practices during their 14th annual Healthy Worksite awards presentation. Equity Trust Company’s tradition of giving back to the community continues several holiday activities including a food drive, turkey bake and a toy drive. Equity Trust employees participated in a toy drive to supply Christmas gifts this past year to members of the Boys and Girls Clubs of Lorain County (Ohio) – Desich Family Campus. Equity Trust is proud to be recognized for the fifth time by the Employer’s Resource Council (ERC) as one of the Top 99 workplaces in Northeast Ohio. The Boys & Girls Clubs of Lorain County celebrated the opening of its new central kitchen at its facility located in Lorain, Ohio with a ribbon-cutting ceremony on March 2, 2017. The 1,140-square-foot kitchen, provides the organization a more efficient way to distribute more than 12,000 hot meals per month to children at 17 locations throughout the county. The Morning Journal - The Boys and Girls Club of Lorain County unveiled its new community kitchen at a dedication ceremony at its Pearl Avenue location in Lorain. The Desich Family Campus’ community kitchen is a $150,000 project that was three years in the making and brought together community sponsors, local non-profits and government funding. This is the first phase of a project that will see more expansion in the years to come.